In this two part moving image and sound work artist Robert George captures the interior landscape of the human mind, to consider death and life after death. He captures a space in which the waking mind gives way to the unconscious mind, where dreams, memories and symbolism take over. Absence is all that is left behind (2013), portrays life after death in one long continuous shot. It is a surreal moving image work that is full of luminous light with one figure who’s details burn out to white light. The Embrace of Night (Go To Sleep) (2013) contemplates the possible frenzied moments surrounding death. It is an aggressive visual piece with a rapid rush of figures that come and go from the dark. This piece involves over 500 edits. Increasingly, George’s filmic art practice is non-narrative and experimental. As a film maker George still values fundamental techniques and the craftsmanship of the film medium, working consciously on colour, tone, lighting, framing and editing. Visually his moving images are highly stylised and heavily treated a lasting influence of 10 years of experience in the film and post production industry. 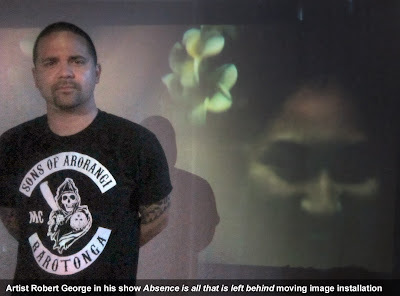 Robert George is an Auckland based film maker with Cook Islands and Māori (te Arawa) heritage. Originally he studied Fine Arts and Design at Waiariki Polytechnic in Rotorua before completing a Bachelor of Arts majoring in Sociology from Victoria University, Wellington in 2001. George has a background in painting and illustration and over 10 years’ experience within the Film and Television industry. Recent exhibitions include, Fly Me Up To Where You Are: Te Waharoa in collaboration with Tiffany Singh for the Auckland Arts Festival 2013, and PIRIANGA TOTO - BLOOD TIES, Fresh Gallery Otara, 2013. 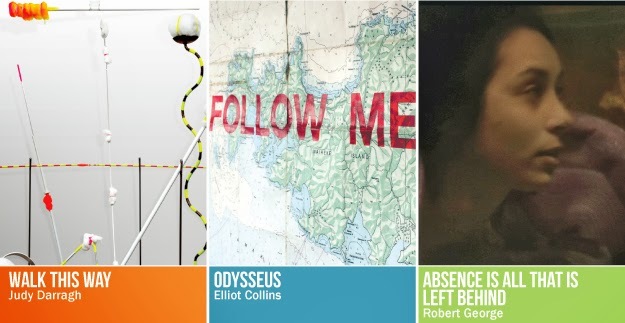 Corban Estate Arts Centre's latest exhibitions by Judy Darragh, Elliot Collins and Robert George are three distinct art installations assembled out of objects, text, moving image and sound, on display from 25 October to 1 December 2013. Judy Darragh’s newest floor and wall based installation is constructed out of consumer by-products and everyday objects that are attacked with intense colour. Infamous for her resourceful use of non-valuable materials, Darragh contorts these materials into new and unrecognisable assemblages. Artist Elliot Collins fills the gallery space with text, sculpture and photography in his latest exhibition based on The Odyssey by Homer. Collins visually relocates the story line to take place within the islands of the Hauraki Gulf, representing his on-going interest in the perception of New Zealand as a vibrant place for exploration and discovery. While artist Robert George captures the interior landscape of the human mind through large scale moving images and sound. He creates a space in which the waking mind gives way to the unconscious mind, where dreams, memories and symbolism take over. On offer is a full range of free art gallery activities. Artist Elliot Collins will run a kids workshop on Saturday 23 November and the curator will give a guided tour of Judy Darragh’s latest exhibition on Saturday 30 November. Artist Simon Kaan examines whenua (land) issues in this latest exhibition through landscapes that depict the connection of land to water, and land to sky. To consider the responsibility that belonging and living in a place has. These hauntingly sparse vistas relate to Kaan’s political concerns toward land and access rights. Sparseness is essential in the work, he explains it allows room to breathe, pause and meditate on what is not there. It alludes to the unseen spiritual and physical connection his shared ancestors would have had in the past. 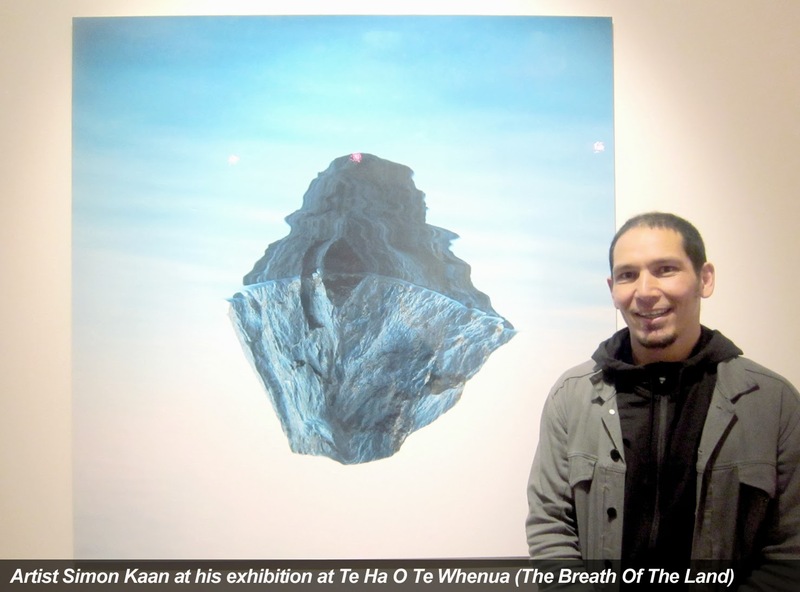 Kaan’s landscapes are ancestral, within the landscapes are a combination of visual motifs inherited from the artist’s Kai (Ngāi) Tahu and Chinese heritage. Ancestral balance is important to Kaan and this is demonstrated by neither image dominating the other, but rather coexisting within the picture plane. Structurally his landscapes follow the traditions of classical Chinese landscapes in which there is often a flow top to bottom, left to right. “The landforms that Kaan creates are often loose adaptions of actual views or embedded memories, in which he captures the rhythms of the land. These portrayals of land are once again accompanied by images of water, that seem to simultaneously divide and synthesise, in the form of rivers, waterfalls, mist and oceans,” Sanderson Contemporary Art. As land, sky and waterways continue to dominate Kaan’s art practice he is able to capture scenes that are not only shaped by natural physical and political forces but also by absence and ancestry. Simon Kaan is a renowned painter, printmaker and multidisciplinary artist who lives and works in Dunedin. In 1993 Kaan gained a Diploma of Fine Arts with Honours, majoring in Printmaking from the School of Fine Art, Otago Polytechnic. Since then his work has been exhibited publically and with dealer galleries in New Zealand, Australia, New Mexico USA and China. Kaan was awarded the Creative New Zealand Red Gate Gallery Residency in Beijing in 2004. In 2012 he presented an installation at the International Symposium of electronic arts in New Mexico, USA.